Disclaimer: if you've already seen my Quilting pages, then this page is a repeat of the Sanders Heritage Quilt on that page, but with an emphasis here on the embroidery. Kevin has a rich and varied cultural heritage. I wanted this quilt to reflect and incorporate all the different aspects of his heritage ... and my poor one brain cell is now completely fried. 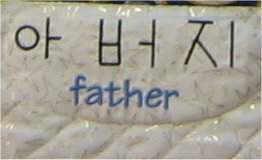 Harold (Dad) is American of Korean & Caucasian ancestry and is in the USAF. Judy (Mom) is Canadian, ethnic Chinese and belongs to the Alpha Phi college sorority. This Sanders family finally settled in Texas, where Kevin was born. The final quilt managed to incorporate (tastefully, I hope) all these elements. Deciding on the quilt blocks and layout was the first hurdle. I had specific fabrics to use and wanted to showcase them properly. My quilt design software helped enormously in auditioning the blocks and the fabric. Some blocks that looked fantastic on the screen turned out to be too small in scale in real life. Eventually, I settled on plain fabric blocks paired with snowballs. 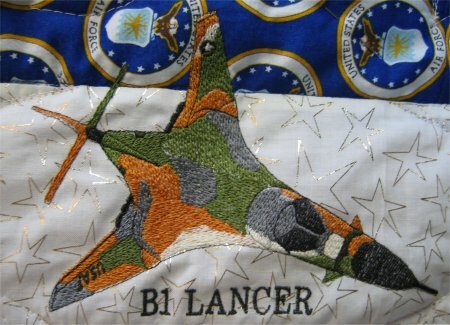 For Harold, the fabrics were a USAF logo and Americana flags. For Judy, the fabrics were Canadian Maple Leaf flags (that I actually bought while in Canada one summer). For Kevin, the fabrics were Texas Lone Star flags/Texas Bluebonnets and the same Americana flags. The snowball and background fabric is a stunning white with gold metallic outlined stars in an overall pattern. Since the plain block fabrics were mostly blue, I chose different red fabrics to complete the snowball blocks, resulting in a very patriotic red-white-blue quilt. Now, the challenge was to make those written words suitable for machine embroidery. This is called "digitizing". Digitizing is NOT a simple process. I was scared spitless to start and delayed doing so for a long time. I downloaded free and purchased tutorials in digitizing to begin teaching myself. Because I had sort of a timeframe I wanted to get this quilt done by, I didn't do the tutorials in strict order ..... I picked out the designs that had the elements I wanted to learn to do. This made the digitizing process somewhat more difficult than it needed to be. BUT ... oh. my. gosh. I did it! I DID IT! Can I emphatically jump up and down and shout that I DID IT???? Granted, the Korean words are very, very easy ... all straight lines ... but, I even figured out how to do the circle! :-) I did a test stitch out and 2 people verified that what I digitized was correct. Boy, was I relieved! One person was the Korean dental patient and the other was due to the generous helpfulness of participant of the online quilting forum I belong to. The forum participant's daughter studies Korean martial arts. I uploaded pictures of my stitch-outs to a temporary webpage. The martial arts instructor graciously looked at my stitch outs and also said they were correct. The next challenge came when I was talking on the phone with Judy. She knows I have a embroidery machine (she was there when I bought it). 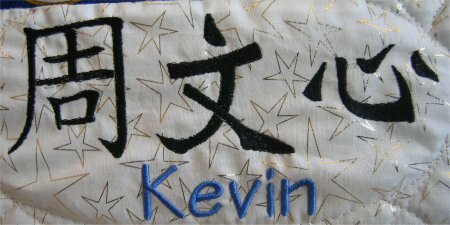 I had wanted to put the baby's Chinese name on the quilt but didn't know how to surreptiously get a graphic of the name. That particular problem was solved when Judy *asked* if I could digitize it!! Woo hoo!! So, I asked if she would also send along a graphic of her own Chinese name .. and silly her (she ought to know me by now! ), she sent it to me. :-) Now, forming Chinese words are much more complex than Korean words. I fussed and fretted over this for quite a while. BUT .. I persevered and I did it! I DID IT! Oh. my. gosh! I digitized both Kevin's and Judy's Chinese names! woo hoo! OK .. that left Harold's name. 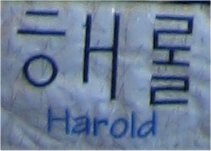 The problem is he doesn't HAVE a Korean name .. but ... the Korean dental patient said she could write out the name phonetically in Korean, so that anyone who could read Korean would then be able to pronounce Harold's English name. So .. I digitized that. wow ... I am exhausted. 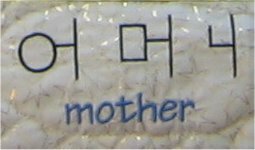 The final result is that the right side border reflects Kevin's mother's side: Chinese words for health, love, father, mother, son and a design for the Alpha Phi sorority that I put together using pre-digitized elements. 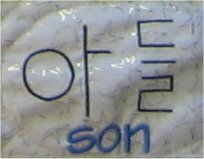 The left side border reflects Kevin's dad's side: the same words in Korean: health, love, father, mother, son and (boy, was I incredibly lucky to find this one) a pre-digitized design for a B1B bomber that Harold used to pilot. 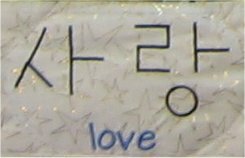 The bottom border is a combination for the "family" .... the phonetic version of Harold's name in Korean, Kevin's Chinese name Chow Mun Sum, Judy's Chinese name Chow Yee Ping. And because I found it and it fit in so perfectly, the top border has a pre-digitized design of the US and Canadian flags. That left the quilting. Oh my gosh .. the quilting. I am discovering that I really dislike the quilting process more and more .. even though this was just a baby sized quilt. The center medallion is an overall pattern of stars and loopy hearts. The inner borders have a wonderful viney leaf pattern. The outer borders have the words emphasized by ovals and cross-hatched between the ovals. Because I kept dragging my feet on this part, it seemed to take an inordinate amount of time, but eventually, eventually, it got done. Do you notice the dynamic, diagonally stripe that forms the binding? This lends tremendous visual interest in this very small area that might otherwise be just a boring afterthought. The binding was the final straw in problem solving. Because the outer border was the wonderful white with gold stars fabric, I really wanted the same fabric for the binding. But, when I bought this fabric, I had no idea what it was going to be used for. The amount that I bought was just a *tad* less than I needed ... I didn't have enough leftover to bind the entire quilt. Given the fact that I bought this fabric several years ago AND there is no way of knowing where I bought it, obtaining more was out of the question. This was very annoying. I hate being stymied when I want something. And a mere lack of fabric was NOT going to thwart me. I do not like problems; I like solutions. 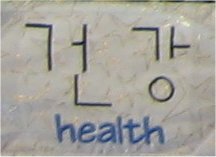 * the Chinese words "health" and "love" came from Ann the Gran in the Oriental category. 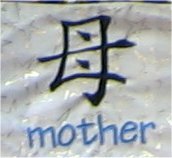 * the Chinese word "father", "mother", "son" came from Snow Fyre in the embroidery/freebies 2 category. * the Greek letters came from Buzz Tools in the Free Stuff/Embriodery Designs/Archived Designs/Alphabet and Symbols category. 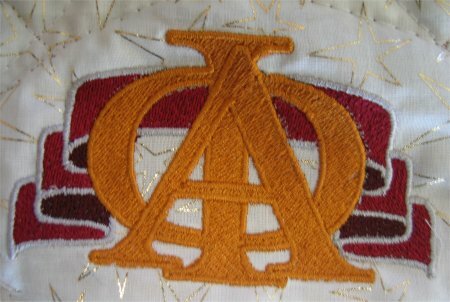 * the ribbon for the Alpha Phi design came from AyeOne Machine Embroideryin the Free Designs 3 category. The base URL is www.ayeone.com and you are welcome to try and find it yourself. * the incredible B1B design also came from Ann the Gran in the Transportation/Air category. 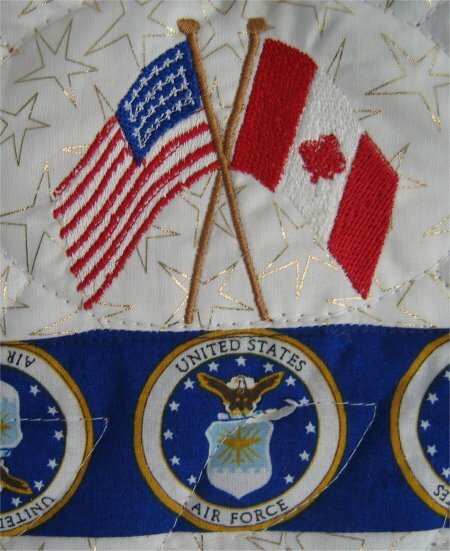 * the USA and Canadian flags came from Flying Needle in the Free Designs category. The base URL is www.flyingneedle.ca and you are welcome to try and find them yourself. * Unfortunately, I downloaded the alphabet used for the English words before I started documenting where I got them from. It's called TK Alpha and is very versatile. I wish I knew where I got it.